I know Dom Perignon didn’t actually say it- but its a nice quote and a genius marketing scheme! And its written on the walls at the truly wonderful Bramon Wine Estate. The Bramon Wine Estate is a magical place found in The Craggs of Plettenberg Bay- and is the first wine farm to be found there too! I’ve got to give you a little bit of their history because it really is so interesting and admirable. The farm is run and owned by Peter and Caroline Thorpe- and named after their children. The first vines of Sauvignon Blanc were planted in 2000 and in only 12 full years there are now 18 other wine farms in the area!! 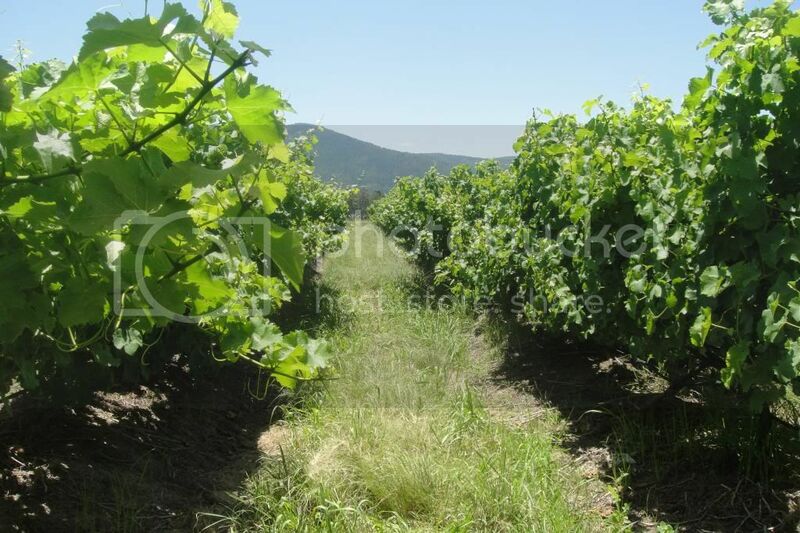 According to their website (www.bramonwines.co.za) they are hoping to create a ‘Sparkling Wine Route’ along parts of the Garden Route. 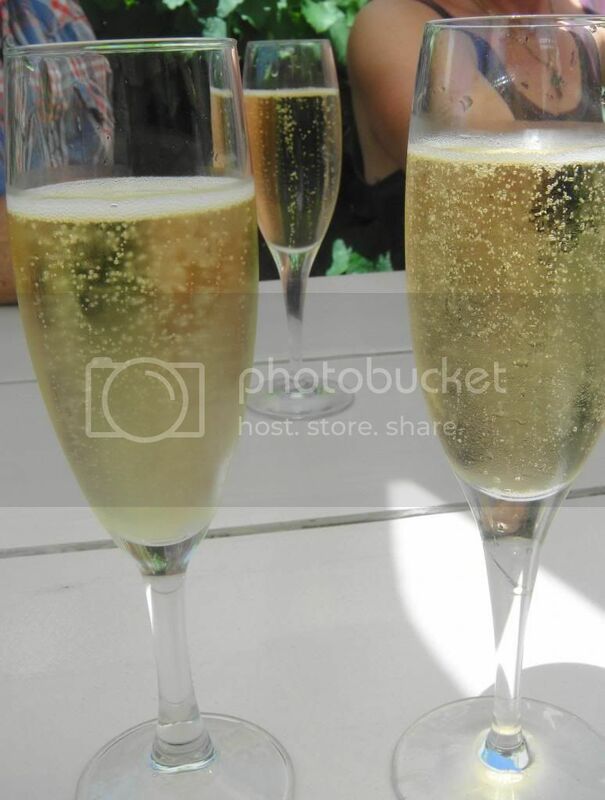 Our lunch started with two bottles of their wonderfully chilled MCC Sparkling wine- and it was wonderful and dry! I would definitely be keen on a ‘Sparkling Wine Route’ if they intend to go forward with such level of quality. 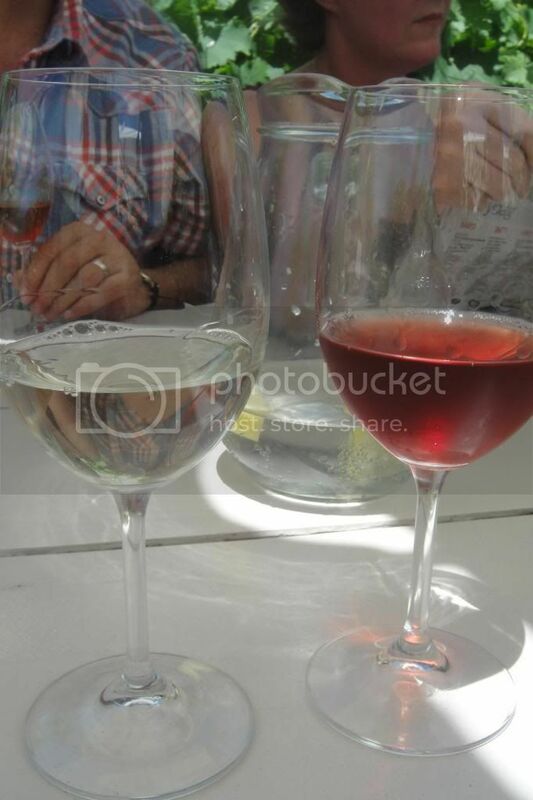 One thing I must suggest is that you absolutely have to go for lunch at Bramon- and with that comes another suggestion- you absolutely have to book and you have to book a table in between their grape wines under an umbrella! What a perfect setting for lunch at a wine estate! 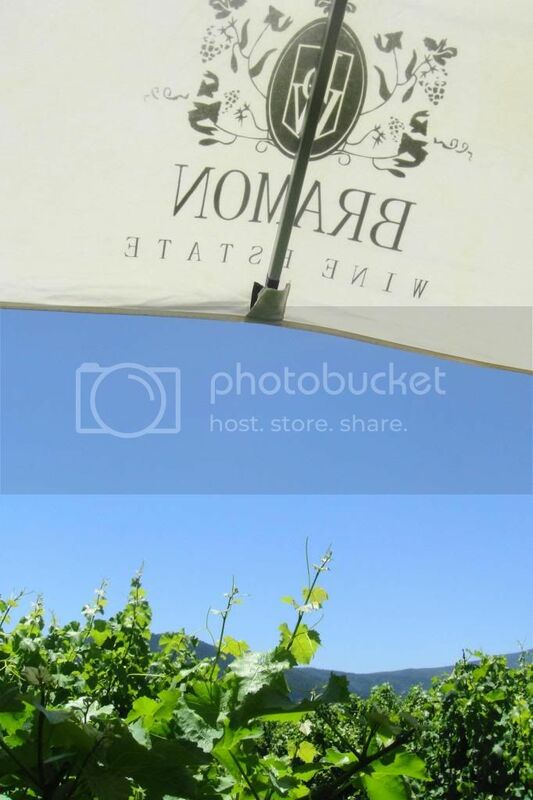 Right in between the vines that provide the wine- a novel and charming idea! After the 2 bottle of champagne we moved on to the 2012 Sauvignon Blanc and a bottle of their rose. Our table was very happy with both of them and by the end of the lunch we had been through another bottle of the sauvignon blanc and the rose. Totalling us at 6 bottles for 9 people… it was a very merry lunch indeed! 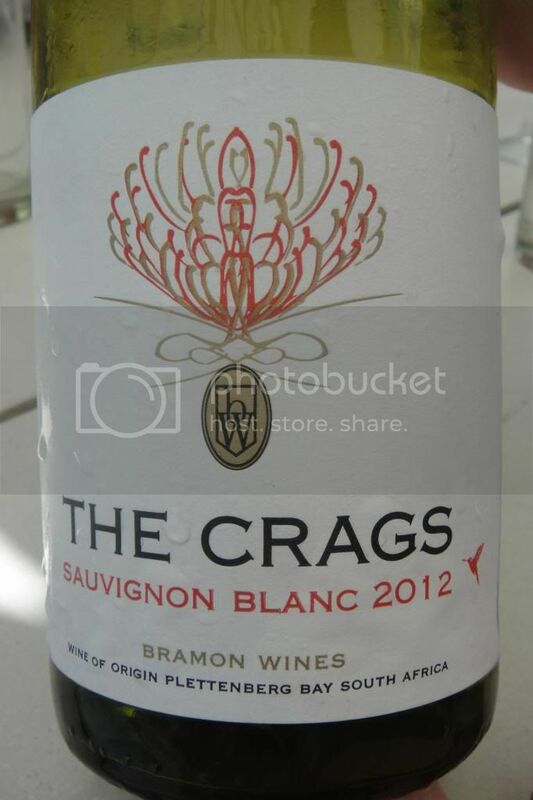 My favourite was their Sauvignon Blanc named The Crags after the region they are farming in. It was a lovely light, crisp wine with full fruity flavours of granadilla, figs and litchis. Now on to the the mind blowing lunch. The deal is they give you a little paper menu with a whole variety of picnic items and you tick off want you want for lunch. We were advised to go with 2 large loaves of bread for R35 each for our table of 9. And then to pick 2/3 items each to mix and share. I think we were all so excited by the menu that we went with about 3/4 each! We had an awful amount of food- but goodness it was delicious and we didn’t leave a single bite behind!! One thing I must say- and I hate to say it- we waited forever for our lunch to arrive! We waited just over an hour! Which is madness! 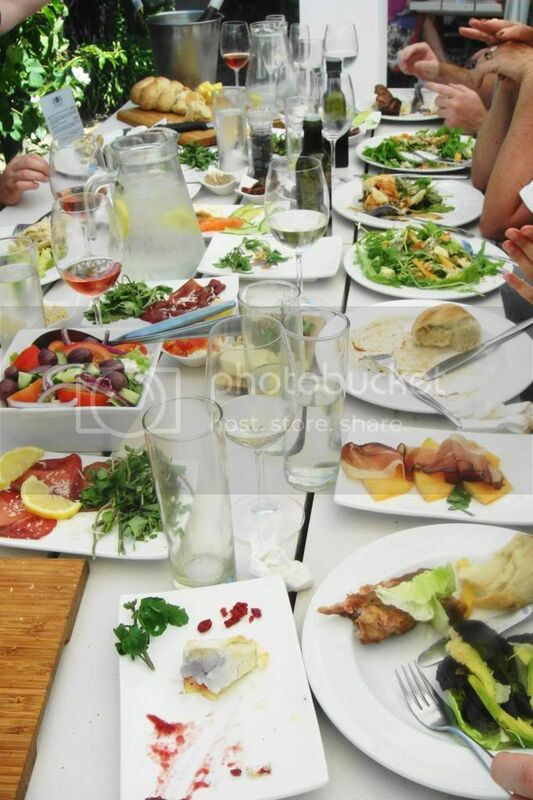 I do understand that during the summer rush things get crazy- but goodness we were hungry when the food arrived! 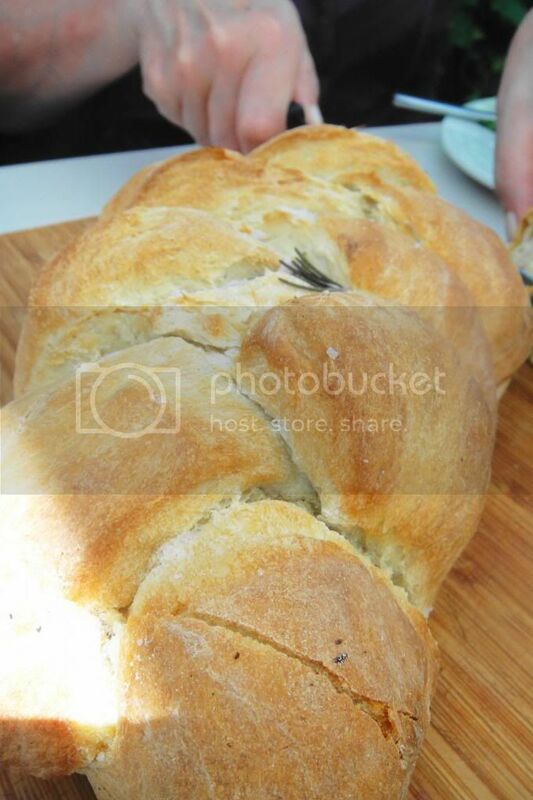 The bread was wonderfully fresh and served warm with crushed sea salt and rosemary sprigs on top. We ordered lots of wonderful things to put on it. One of my favourites was the hummus for R10 in the top left picture- creamy and smooth and earthy- delicious with the soft warm bread. The caramelised onions are normally my favourite but these were overpowered by the strong citrus orange so didn’t mix well with other toppings. 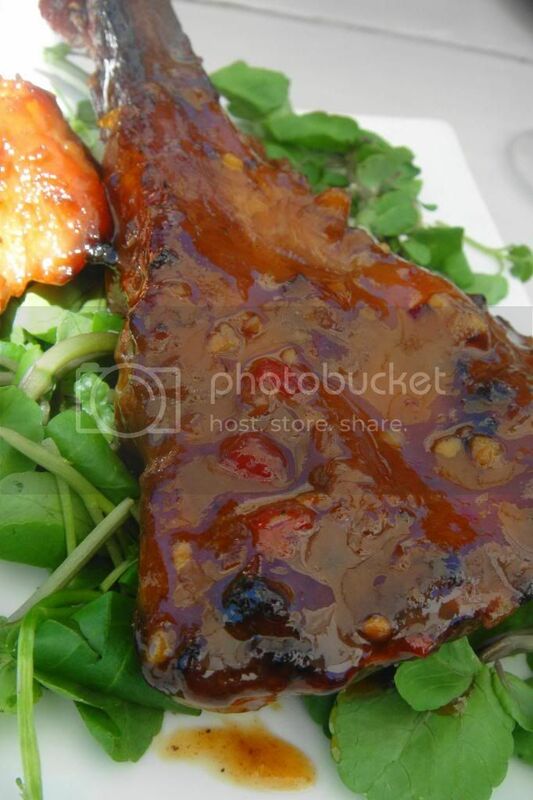 But if you’re a fan of citrus flavour this is definitely an interesting twist on caramelised onions and worth a try! Next up was the springbok carpaccio for R35. I think this was greatly hindered by the intense heat for the day because the poor rocket was terribly wilted and the carpaccio was on the dried side but worked well with some of the creamier cheeses on the fresh bread. The salmon served with cream cheese, avo, cucumber and fennel for R38 was lovely and refreshing. The melon with black forest ham with melon for R35 was lovely- the melon was super sweet and delicious. The gorgonzola served with fresh herbs and sweet strawberries was lovely and generously smeared on hot rolls and greedily devoured. Bramon gets serious points for their amazing cheeses! I can’t say a thing about the ribs because the manager did tell us that they had sold out of the good lower pieces and offered to change our order but we insisted on the ribs against her advice- and even though they were full of flavour and delicious it was mostly bone and impossible to eat. This is our fault and not theirs! On the right is my favourite order of the day! 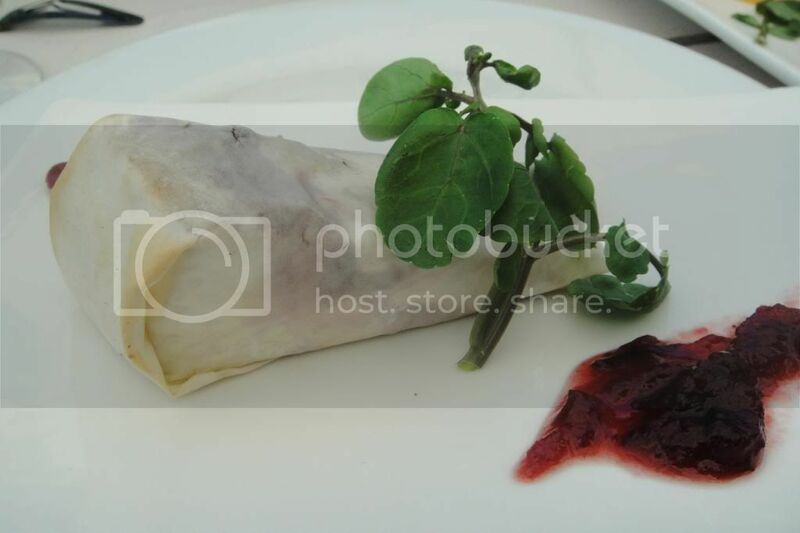 A triangle of brie with dried cranberries wrapped in phyllo pastry and served with cranberry sauce! 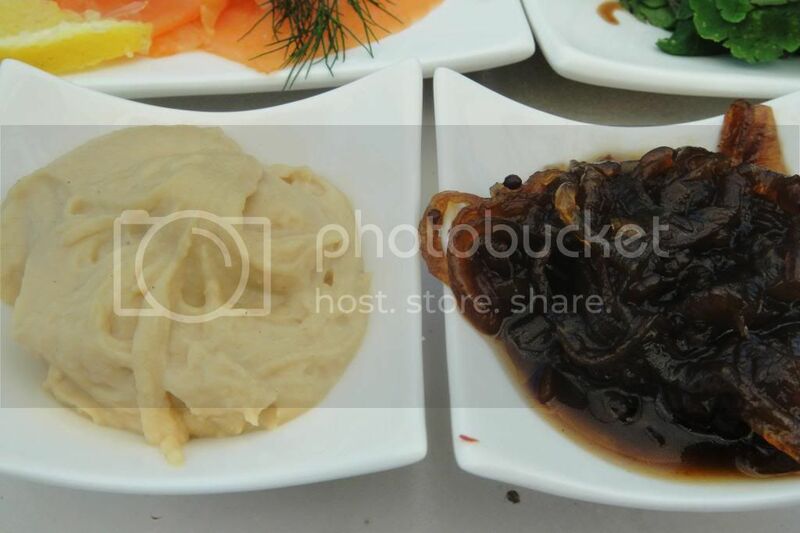 Here you can see the gooey magic that is this dish! Wonderful!! The brie was baked through and soft and worked perfectly with the sweet and tart cranberries. This is delicious- and when i return again I will be ordering one for myself alone! We fortunately cottoned on to the greatness of this and hid it down our end of the table! Sneaky- but worth it! Perfect eaten on its own or squished onto a warm piece of salty bread. 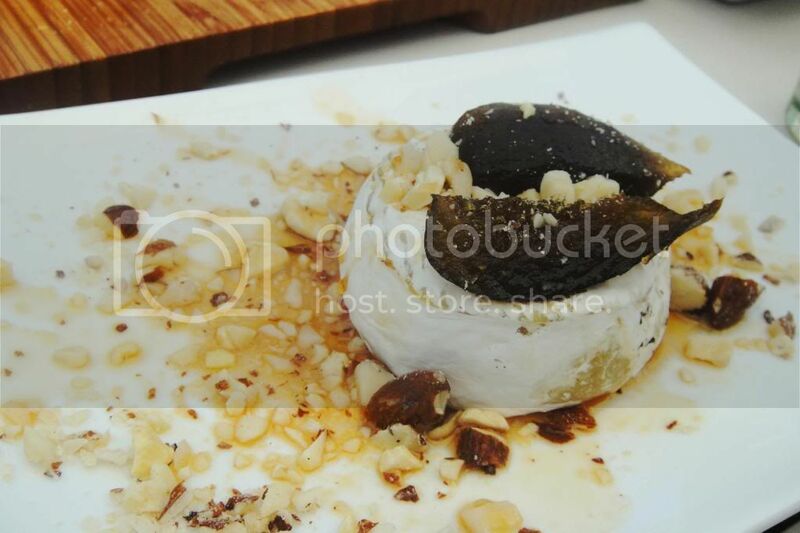 Another absolute favourite is the baked Camembert with figs and nuts and drizzled with honey for R55. This was amazing! And another must order- soft Camembert with sweet honey, sweet figs and crunchy earthy nuts- an absolute taste sensation! Another popular one was the chicken liver pate for R15- just so delicious! I could eat it out the dish with a spoon! 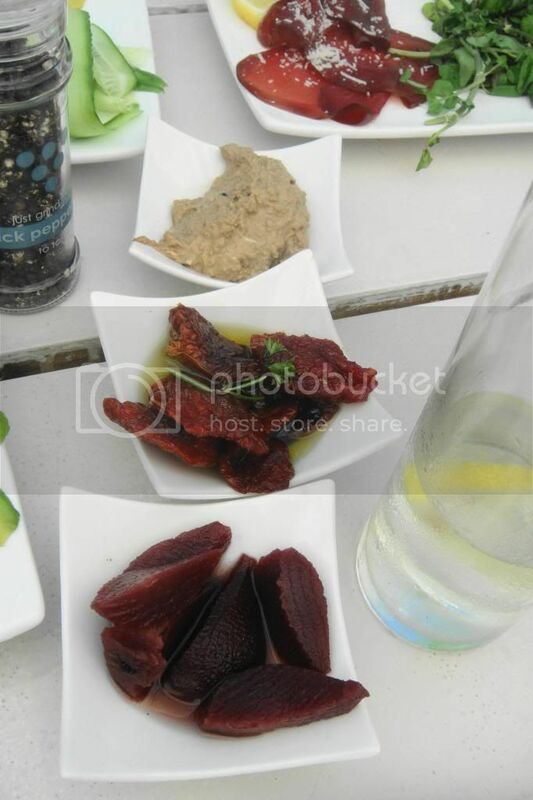 The sundried tomatoes for R20 worked well with lots of dips, the bread and the salads too. And the beetroot was also a good addition to most things. We also chose three of their salads (see how we got carried away??). This is the rocket and blue cheese salad with dried pears and walnuts for R60. This flavour combination of pears and blue cheese was wonderful- such a treat! The Avo and roasted Parmesan salad for R60 with all the amazing options on the table this one was a little boring- but I added some sundried tomatoes and combined it with the Greek salad for R55. The Greek salad was great- really fresh and healthy. That’s the best thing about a Bramon lunch- all the ingredients are incredible fresh and packed with flavour! So- lunch was wonderful, the cheeses are superb and the wine is delicious! I would definitely recommend trying to make a booking if you’re in the area- but be careful during tourist season- availability is scarce and the restaurant is crazy full! !